As an experienced family law attorney on Long Island I receive a lot of questions about Orders of Protection. Here are answers to some of the most frequently asked questions about orders of protection. If someone close to you, such as an intimate partner or a family member, is abusing you, you may be able to obtain an Order of Protection against them. An Order of Protection is a court order that will require the abuser (the “respondent”) to stop abusing the victim (the “petitioner”), and may also contain additional instructions that the respondent must follow. What is a Child Protective Proceeding on Long Island? As a Long Island Family Law Lawyer practicing in Nassau County and Suffolk County, it saddens me to think of all the cases I’ve seen where a child is in need of protection from their parent. In cases where it appears that a child under 18 years of age has been abused or neglected or is in danger of being abused or neglected, a child protective proceeding may be commenced by a child protective agency. Abuse is defined as any behavior that results or is very likely to result in serious physical injury to the child, or any sexual offense. Neglect is a failure of the parent to adequately meet the child’s educational, medical, nutritional, or other basic needs. In Nassau County and Suffolk County, this child protective agency is known as Child Protective Services (CPS). CPS can petition the Nassau County or Suffolk County Family Court, and the parent or caretaker that is suspected of abuse or neglect will be the respondent. The proceedings are initiated to determine whether the child is or may be in danger of abuse or neglect, and what action if any needs to be taken by the court to ensure the child’s safety. In certain emergency situations in which there is an immediate risk to the health and safety of a child, CPS can remove the child from the home without a court order. If the child is removed, the parent is entitled to a prompt hearing to determine the truth of the allegations, and whether a less severe action is appropriate. A court will hold a “fact-finding hearing” to determine whether abuse or neglect has been proven. A “dispositional hearing” will occur if abuse or neglect has been proven in order to determine the disposition of the child; in other words, the court will determine what services are needed for the family, and whether the child can remain at home with the respondent while those services are offered. CPS will conduct an investigation in order to compile a report for the court’s review. CPS is a government agency that represent the interests of the state – namely, the prevention of child abuse and neglect. While there is a strong public policy against child abuse and neglect, parents also have rights and parents are encouraged to hire a family law lawyer with experience in Child Protection in order to protect these rights. Minor children may also have legal representation by a law guardian, who can protect the child’s legal rights in court. All of these interested parties will appear before a family court in Nassau County or Suffolk County child protective proceeding. The court will consider the interests of all parties within the context of the law to determine the best possible outcome given then circumstances. Depending upon the circumstances of each case, possible outcomes include (1) returning the child to the parents or guardians on conditions specified by the court, such as continued monitoring by CPS or completion of mental health or parenting programs, (2) placing the child in foster care while services such as parenting classes or mental health treatment are provided to the parent, (3) releasing the child to a fit and willing relative who will care for the child, known as kinship care. In some kinship care cases, the child will be able to remain in the home with a parent or guardian who is not a respondent, but the respondent parent will be instructed to leave the home for the duration of the proceeding. The court will continue to monitor the progress of the family with periodic updates and hearings. Foster care and kinship care are temporary solutions to an acute family issue. Ideally, parents and children will be rehabilitated so that any abusive or neglectful behavior ceases and so that children can return home to a healthier family environment. Parents who face intervention by a child protective agency may feel vulnerable, as their rights to parent their children free of state intervention will be threatened. However, it is only in cases of abuse or neglect that the state may intervene against the wishes of the legal parent or guardian of a child. It is important that any parent involved in such a proceeding take it seriously and understand their legal rights. Because of the sensitive nature of such a proceeding, it is important that parents seek the counsel of a Long Island family law lawyer experienced with representing parents in such proceedings in Nassau County or Suffolk County Courtrooms. The Law Office of Hornberger Verbitsky, P.C., is experienced with child protective proceedings and knows the rights of the parents involved. If you are involved in a child protective proceeding, contact us at 631-923-1910 right away for a free consultation. Our 41-page “Guide to New York Divorce: What You Need to Know Before Hiring a Divorce Lawyer in New York” written by an experienced family law lawyer Long Island’s Robert E. Hornberger, Esq., provides you with real information on the divorce process and the laws it rests upon in the state of New York. This book will help give you a solid foundation upon which you can begin the process of making your family’s, life better. 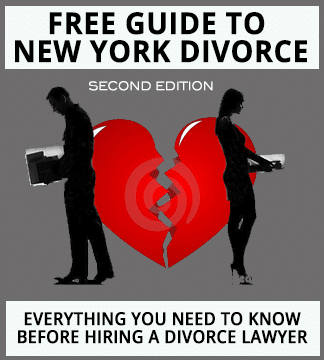 Download your Free Guide to New York Divorce here. As a family law attorney serving Suffolk County and Nassau County residents of Long Island, I am saddened to see a number of domestic violence cases each year. For a person experiencing family violence, including threats or other abusive behavior, an Order of Protection is a helpful tool that can help to limit the behavior of the offender. In Suffolk County or Nassau County Family Court, these orders are often between a current and former spouse, a person with whom the victim has a child in common, another family member related by either blood or marriage, or a person with whom the victim has had an intimate relationship. Many Orders of Protection in New York are “limited” in that they allow contact between the offender (also known as the respondent) and victim (also known as the petitioner) so long as there is no harassment, physically abusive behavior, or other intimidating or threatening conduct. Orders of Protection can vary greatly depending on the circumstances of each case and the reason the order is needed. Orders of Protection can instruct an offender to “stay-away” from the victim and the victim’s children and/or to “refrain from” certain abusive behaviors or activities. In certain circumstances, an Order of Protection may direct the offender to move out of the home in order to protect the victim. An order will likely direct the offender to refrain from threats, intimidation, or physical abuse. The Order of Protection can also instruct the offender to follow custody orders, pay child support, to not have a gun, or to stop calling or texting the victim. Orders of Protection may be issued by the Family Court, Criminal Court, or Supreme Court. The existence of any other legal proceeding involving the parties may determine which court issues the Order. For example, for couples involved in a divorce, an Order of Protection may be issued in Supreme Court where the matrimonial proceeding is pending. For parties involved in a domestic violence or other criminal charge in Criminal Court, the Criminal Court may issue the order. And, finally, a family member may petition the Family Court for an Order of Protection. In Family Court, the victim may wish to file what is called a “Family Offense Petition.” The petition should contain all of the relevant information, including the conduct and behavior that caused them to believe the protective order is necessary. Once the petition is filed, a temporary order of protection may be issued until the other party has a chance to appear in court. Once the court determines that, based on the petition, an Order of Protection may be necessary, both parties will be asked to appear in court. The judge will decide which terms and conditions are to be included in the order based upon the nature of the offense and conduct in the petition. An Order of Protection is often a useful deterrent for abusive behavior. It is a crime to violate an Order of Protection. The Order acts as probable cause for an arrest if police are called to a scene of a domestic dispute. This means that the police will not have to use judgment in determining whether to arrest the offender at the scene; the order of protection will allow the police to arrest if it appears that the Order of Protection is being violated. Any violation of an Order of Protection can result in new criminal charges. It is important for offenders to know that even if the victim/petitioner initiates the contact, it does not excuse the violation of the Order of Protection. If you believe that you may need an Order of Protection, or if an Order of Protection has been issued against you, it is important that you speak with an experienced attorney to know your rights and options. The Law Office of Hornberger Verbitsky, P.C. can assist you with your Family Law and Divorce Law matters in Nassau County and Suffolk County. Contact our office at 631-923-1910 or fill out the short form on this page to schedule your free consultation.